The folks over at CorAccess have been doing it right from the start. 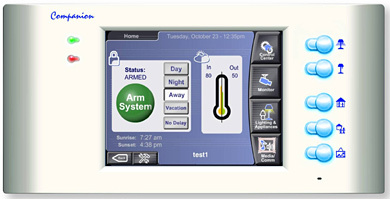 Slick, intuitive, fast user interfaces and great looking touchscreen panels is want we all want in a home automation control panel. Their Companion line interfaces perfectly with HAI‘s OmniPro controller panels and can be used to control lighting, HVAC, security, media controller, and as a picture viewer. The interfaces can be customize with Macromedia‘s Flash authoring tool… Very cool! I hope to get a demo unit and write a review as soon as I get my OmniPro II installed and setup. Home Control Interface Is Almost Ready! Automate Your Irrigation/Sprinkler System with Rain8!